Fabtech 5.5" lift kits allow you to add extra clearance and turn your truck into an off-road beast! Fabtech lift kits are simple and effective, delivering true additional clearance while maintaining a factory like ride. Fabtech lift kits allow you to add larger wheels and tires to your ride! The upgraded suspension components that make up these kits are designed to take the place of your factory parts and install in their place. This makes installation pretty quick and simple without the need for drilling or modifying your factory suspension. 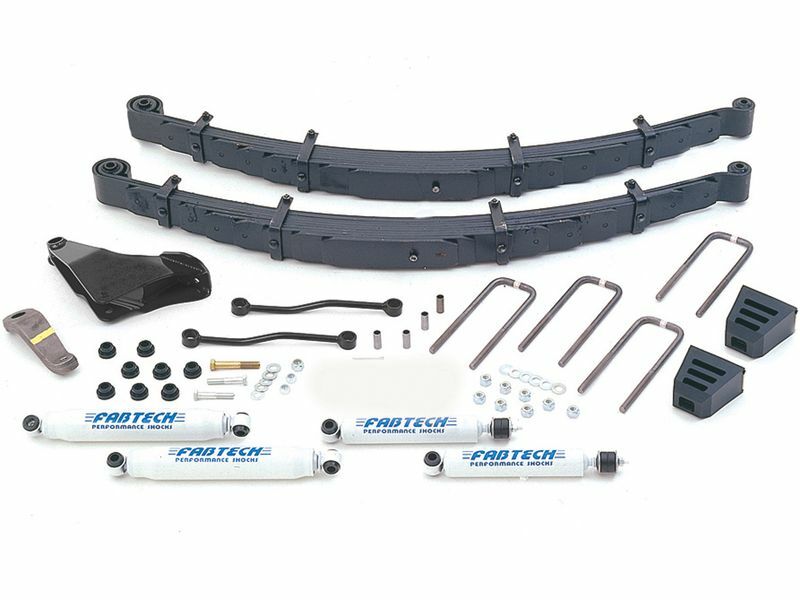 These are complete kits and will lift both the front and rear of your truck. Most kits come with longer shocks and come in a variety of options for you to choose from. Lift your truck right with one of the best suspension upgrades money can buy and order a Fabtech 5.5" lift kit today! Even though we recommend having your Fabtech lift kit installed by a shop, that doesn't mean you couldn't do it yourself. Fabtech lift kits alter your suspension and may require tools that most people don't have lying around their garage. You should also have your vehicle aligned once your lift kit is installed. If you have any questions or would like additional information, please give us a call.